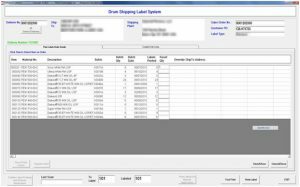 For this application, the customer needed to identify individual drums within an order and update product counts accordingly. FOX IV supplied the custom software as well as the label printer-applicator system. 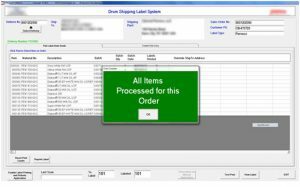 Utilizing the FOX IV PC based software application, the operator enters the order number and software access the customer’s SQL database to find all of the products that need to be labeled on that particular order. As each drum reaches the labeling station, a scanner reads a bar code on the drum and sends that information back to the PC. 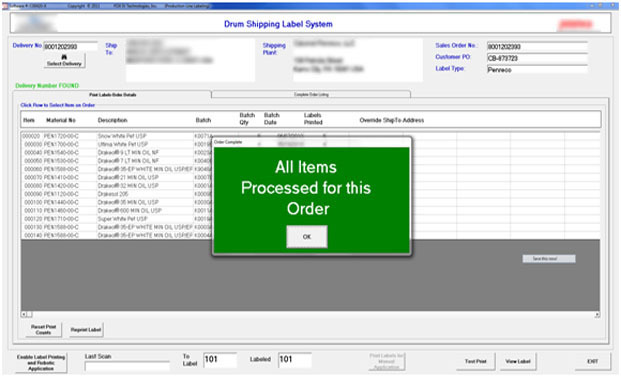 The label format is generated and sent to the label-printer-applicator. The product count is then updated for that product. If the scanner cannot read the barcode on the drum, the product information can be entered manually. When the order is filled, a message appears on the screen.